A number of important, hotly-contested races are on the Aug. 28 primary election ballot. Make sure you have a say in who will represent you in the nation’s Capitol and at the state legislature. If you’re not registered yet, July 30 is the cutoff date. Primary elections may not get as much buzz as general elections, but in many districts with lopsided partisan registration numbers, the primary is where the real decisions are made. Make sure your voice is counted. Register to vote online. If you’re not sure if you need to register, you can check your status by going to the Pima County Recorder’s website. And don’t forget, if you’re an independent voter, you may choose the partisan primary you’d like top vote in. Questions? Call the Pima County Recorder’s office at 520-724-4330. Tucson Medical Center CEO and President Judy Rich will serve on a panel discussion with leaders across other health systems to discuss viable ways to ensure quality, affordable health care for every American. Andy Slavitt, the former acting administrator for the Centers for Medicaid and Medicare Services, as well as former U.S. Sen. David Durenberger are among the well-known health care leaders who are supporting the United States of Care effort and are participating in the July 23 discussion. Rich said she is supporting the effort because it builds on the commitment TMC has made to the community. “As a nonprofit community hospital, TMC cares for everybody who comes through our doors, regardless of their ability to pay,” she said. Other panelists include Sandra Hernandez, the president and CEO of California Health Care Foundation, and Mark Zitter, the chair of The Zetema Project. For more information, please visit A Bipartisan Approach to Health Care Reform event page. Any given day at Tucson Medical Center, pet therapy teams including 32 dogs and one miniature pony visit hospitalized patients to share comfort and affection. “They bring their love and their compassion to our patients and they provide a welcome distraction when people are at their most vulnerable,” said Julia Strange, TMC’s vice president of Community Benefit. Many of the dogs on these teams are rescues. It’s just one of the reasons TMC, which appreciates the role pets have in the overall wellness of the community, is supporting an effort to raise funds for life-saving programs at the shelter, said Strange. Your Love Saves Lives campaign through the Friends of PACC, the nonprofit arm of Pima Animal Care Center. The goal of the campaign is to raise $5 million in private donations to expand veterinary services, to purchase needed medical equipment and to support programs such as community cat screenings and behavioral training for dogs. To date, the community has raised more than $4.25 million toward the goal, announced Friends of PACC Executive Director Jennifer Camano. The only open admission animal shelter, which accepts every pet in need, Pima Animal Care Center saved more pets in 2017 than ever before – more than 91 percent, of the more than 16,000 pets it took in. Additionally, the shelter performed more than 7,500 spay and neuter surgeries and addressed more than 20,000 animal protection calls. We don’t have a built-in pool at our home, but we often use a little splash pool which got me to thinking about the safety of above-ground pools — you know, the sort that just go up for the summer, whether rigid sides or inflatable, and come down when school is back in session. As a pediatric emergency department nurse I’ve seen my fill of child drowning victims and so I tend to be hypervigilant around pools. The absolutely crushing part about drownings is that they are nearly always preventable. I asked Jessica Mitchell, Safe Kids Pima County coordinator, what the rules are regarding fencing and general safety practices around temporary above-ground pool structures. “The law…oh the law on pools! It can be so confusing. Pretty much, if you have a pool that is taller than 18 inches and wider than 8 feet intended for swimming, it requires a fence/barrier that is at least 5 feet tall with a self-closing or self-latching gate. The entire law for pools can be found on the Arizona government pages“ Jessica shares. “Mesh fencing is a great option for those with above-ground temporary pools because when the pool comes down, the mesh fence can also come down. There is one exception to having to put up a pool fence, and that is if everyone in the household is 6 years or older, no safety measures need to be in place. This doesn’t mean this is the safest option. Not everyone over the age of 6 can swim, and even swimmers can get into difficulty in a pool. Also, we worry most about pool mishaps in the summer, but be vigilant all year for drowing hazards. Empty the cooler of melted ice water; dispose of the bucket of mop water; drain the bathtub (and never leave your toddler or pre-schooler in the tub unsupervised). Unfortunately, we see all these drowning scenarios in the emergency department. Whether it’s in the pool, the ocean or the bathtub, you will not hear a child drowing. Drowning is silent … keep your eyes on your child. Always have an adult watching the pool, not reading, not looking at their phone, not taking an afternoon siesta – just watching the kids in the pool. Go ahead and take turns if it’s a social gathering, but make sure that the designated adult knows the rules. Better yet, consider hiring a trained lifeguard. While it seems like the more adults who around, the better. But the reality is that it seems to be the opposite – everyone thinks someone else is wathcing. Make hiring a lifeguard a part of your pool-party budget. Jessica also wanted to remind folks that floaties are toys and not safety devices. If you have a life vest, they need to be the right size, and they are not a substitute for adult supervision. Yes, even with an above-ground temporary pool that you picked up for $75 you want a barrier. It can be mesh; it just has to be at least 5 feet tall and have a self-latching gate. Even if your kids are over the age of 6, what about the neighbors or the grandkids? Make sure the barrier isn’t compromised – there aren’t any chairs or trash cans that can be dragged over to act as a ladder, and that nobody props open the gate. Tucson has lots of great options for swim classes including Vest it Up! TMC for Children and Credit Unions for Kids offer FREE year-round swim lessons at dates, times and locations that meet the needs of busy families. These free lessons are at local YMCA locations and include a free personal flatation device, or PFD. This U.S. Coast Guard-approved life vest for kids is provided to kids completing swim classes. The free classes are available to the first 400 kids each year between 4-17 years old. Register here for Vest it Up! Having a party? Hire a lifeguard. It seems like the more adults are around to watch the better right? But in reality it seems to work in the opposite way. Everyone thinks someone else is watching. Make hiring a lifeguard part of your pool party budget. We worry especially in the summer when kids are in the pool, but be vigilant all year. Empty the cooler of melted ice water, dispose of the bucket of mop water, drain the bathtub (and never leave your baby, toddler or preschooler in the bathtub unsupervised.) Unfortunately, we see all these drowning scenarios in the emergency department. Whether it is in the pool, the ocean or the bathtub you will not hear your child drowning. Drowning is a silent affair…keep your eyes on your child. Hope your summer is splashing good fun. Melissa Hodges is a pediatric emergency room RN and mom to two young boys. Melissa has been at Tucson Medical Center for 10 years. She is a knitting ninja apprentice who makes a mean chili and enjoys spending time with her family and friends in beautiful Tucson, Arizona. Violence is an ongoing public health and safety challenge throughout the country. Join Tucson Medical Center and hospitals and health systems across the country on June 8 for the second annual #HAVhope, a national day of awareness that calls for ending violence in all forms. “Hospitals serve as the backbone of healthy communities, supporting victims of violence-related trauma, answering the call in times of tragedy and attempting to prevent violence in the first place by building healthy communities and embracing best practices to keep employees safe,” said Judy Rich, TMC’s president and CEO. Share a photo on June 8 of yourself holding hands with others in your community or workplace committed to combating violence. This collection of photos will provide a visual to demonstrate that we stand together to combat violence. Download a sign here. 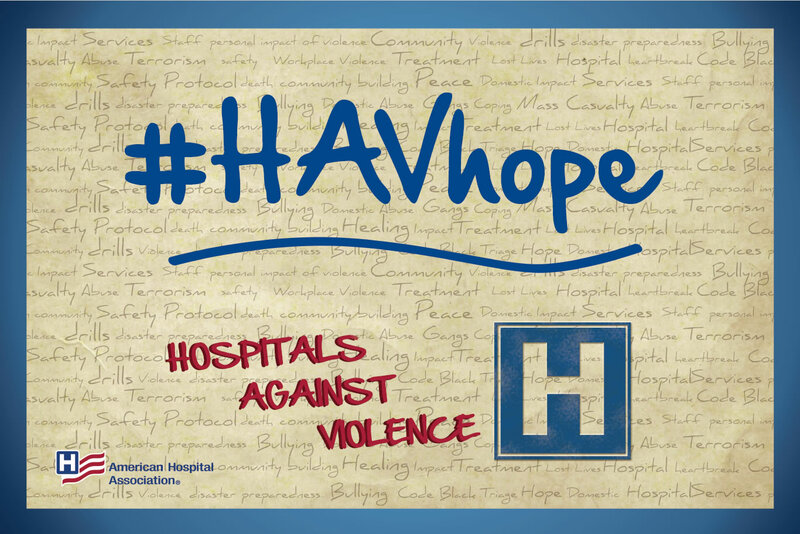 Use #HAVhope on social media to highlight your work or commitment to combat violence in your community or workplace. Master Sgt. Pablo Vasquez may someday be called upon to care for wounded warriors on a faraway battlefield. The medical techinician has to keep his skills sharp to be ready for that assignment. But rather than travel across the country for those training opportunities, he just had to take a short drive across town, recently spending a week caring for patients at Tucson Medical Center. TMC is partnering with Davis-Monthan Air Force Base to provide week-long rotations designed to augment the training of the skilled medical staff working at the base clinic. The rotations will continue through the year. As will his counterparts throughout the year, Vasquez spent two days in the Intensive Care Unit, one day at TMC Wound Care Clinic, one day in the medical-surgical units and two days helping to staff the Emergency Department – which alone sees nearly 100,000 patients each year. Dr. Michael Lavor, a trauma vascular surgeon and Navy vet who deployed to Afghanistan in 2012 to direct medical operations at a base there, came away from that experience knowing exactly what kind of training soldiers need to care for their colleagues. As the Honorary Commander for the 355th Aerospace Medicine Squadron and the former physician leader of TMC Wound Care, he thought there might be a way for those two entities to come together to build a stronger community. He brought leaders from TMC together with leaders from Davis-Monthan to solidify the mutually beneficial training relationship. When nurses Kimberly Fore and Cindy Sacra agreed to staff the first aid booth at the recent Health Insurance Enrollment & Family Fun Festival in early December, they figured they might help with the small injuries that can come along with community running events. With three races that morning, including nearly 1,000 girls and their running buddies doing a 5k through Girls on the Run, they figured it would be the usual. Scrapes. Maybe a blister. At worst, a turned ankle. So in that split second when they heard there was a runner down during a 1-mile running event for men, they thought maybe they’d be patching up a skinned knee. Fore, the director of TMC Hospice, started loping out to the scene. A passing runner told her it was serious. She broke into a sprint and found the runner in the throes of a serious medical event. Sacra, the Clinical Informatics team lead, was right behind her, carrying medical supplies. The two, along with TMCOne front desk service representative Lauren Barnhart, whose son was participating in the race, provided CPR until medics arrived. In large part because of the speedy reaction of the TMC staff member, the man was revived and taken to the hospital. But for others, it was a moment that crystallized TMC’s mission. “Our mission is to provide exceptional health care with compassion. That was on display on this day and I am humbled to work with amazing people who serve our community every day,” said Julia Strange, TMC’s vice president of Community Benefit. It too often seems we are more divided than ever, from political ideology to social issues. The National Institute for Civil Discourse will share actions we can take individually and locally that can serve as a balm to the friction around us. The one-hour discussion will take place at Tucson Medical Center’s The Core at La Encantada at 5:30 p.m. on Nov. 2. Rounding out the Downtown Lecture Series on “Truth and Trust in the Global Scene,” the discussion is open to all participants who want to learn and practice tools and skills to restore civility in their everyday lives. Earlier this year, The Institute launched an initiative to revive civility through small groups and texting platforms to help members of the community build trust and invite open, respectful dialogue. “Engaging in constructive dialogue is something we have to consciously work at – and particularly when our political discourse is often peppered with personal attacks and when we are so often exposed to hateful rhetoric and polarization,” said Basant Virdee, who works on the Institute’s Revive Civility Initiative. Kindness, trust and respect are foundations not just for healthy dialogue, but for healthy communities, said Tara Bruce, assistant manager of The Core. “As a nonprofit community hospital that is committed to building health, we are pleased to support the work of the National Institute as our society continues to grapple with conflict and how we can best respond to it,” Bruce said. Engaged voters are fundamental to a healthy community and a healthy democracy. If you’re registered to vote, watch for a ballot coming soon to your mailbox for Nov. 7’s consolidated election. Oro Valley, where voters will decide on a park improvements package, will have polling sites open on Election Day, but the other jurisdictions are holding mail elections. Please mail your ballot by Thursday, Nov. 2 to ensure your ballot is ready for counting on Election Day. You may also track the status of your Vote-by-Mail ballot online. Simply visit: www.recorder.pima.gov and click on “Early Ballot Status” to ensure your ballot was received and processed. A few years ago, elementary school teacher Monica Bermudez had seen one too many students pull out tortilla chips or candy for their snacks – or worse, lunch. So she started a “Fitness Fanatics” group at her school, volunteering after school to teach as many as 95 students at a time about wellness. It’s become something of the go-to club ever since. On Legendary Teacher Day – a day set aside to honor special teachers who make a difference – TMC celebrates Bermudez, who has been teaching for 33 years and is currently teaching second grade. Fitness Fanatics was her own brainchild. The students earn charms for every mile they run, participate in stretching exercises and play games that keep them active. The program is open to parents and teachers, too, to broaden relationships and opportunities for wellness at the same time. There is also a nutrition component when funding allows, teaching students how to make nutritious snacks at home – from trail mix using cereal, raisins and nuts, to a fruit salad or banana sushi, which is essentially a banana rolled in Nutella and sliced. “I wanted to use things that they can find in their cabinets at home so they can make better choices,” said the 55-year-old Bermudez. She coaches Girls on the Run, a youth development program that teaches life skills and culminates in a 5k run to build confidence and a sense of accomplishment. She also volunteers with Fit Kidz, a program of the Southern Arizona Roadrunners that offers free one mile races for elementary school children. In part, Bermudez does it because she’s become a disciple herself. Although she ran in middle school, she didn’t start running again until about seven years ago, trying to find more balance and take better care of herself. “It was my release,” she said of those early forays into running. The next thing she knew, she was running with her daughters, and then signing up for races, and then joining a running group. She’s since started triathlons and offroad running, and is doing a half Ironman next month. But what keeps her going is what she sees from the kids. Inevitably, the shy girls start running and by the end of the semester they’re raising their hand in class and contributing with confidence. Several of her students have made a pact not to sit during recess, but instead, will either walk or run around the playground. TMC encourages the entire business community to take time today to celebrate a Legendary Teacher who is making a difference in our future. For more information about Legendary Teacher Day, which is always commemorated on the fourth Thursday of September, please visit www.legendaryteacher.com. You may also share tributes of your own Legendary Teachers on Facebook as well. A central goal of the Arizona Hospital and Healthcare Association is to ensure more Arizona families have access to quality care they can afford. The Graham-Cassidy legislation being considered by Congress falls short on both counts. This proposal erodes critical protections for patients and consumers, and would lead to costlier premiums for many individuals – especially those with pre-existing conditions. Millions would lose coverage altogether. From a fiscal standpoint, the legislation represents a massive shift in financial risk and responsibility from the federal government to states like our own. According to an independent analysis by the non-partisan Avalere Health firm, this legislation would reduce federal funding to Arizona by $11 billion between now and 2026. Just as troubling is all we don’t know about this bill. Because of the frenzied fashion in which it is being considered, Congress lacks even the most rudimentary analysis necessary to make an informed decision. The non-partisan Congressional Budget Office has indicated it won’t even have time to ‘score’ the bill in terms of its impacts to patient coverage and federal finances. This process is the furthest thing from a ‘return to regular order,’ as advocated by Senator McCain. The Arizona Hospital and Healthcare Association stands ready to work with our congressional delegation to address shortcomings with the Affordable Care Act, especially to stabilize the insurance market. This legislation is a step in the wrong direction. We urge Arizona lawmakers to vote NO. AzHHA is Arizona’s statewide association for those organizations and individuals devoted to collectively building better health care and health for the patients, people and communities of Arizona. Founded in 1939, AzHHA’s objective is to improve health care through Better Care, Better Health and Lower Costs with the ultimate goal of making Arizona the healthiest state in the nation. For more information, please contact communications@azhha.org or call (602) 445-4300. Youth on Their Own, a nonprofit dropout prevention agency supporting homeless youth in their goals of graduating from high school, did not have a functional space to hold youth events, host Board meetings or engage donors in providing critical services for vulnerable youth. That all changed earlier this spring. A new multipurpose room, adjacent to the program’s resale store at 1660 N. Alvernon Way, was the culminating project of Greater Tucson Leadership, a nonprofit program designed to develop future community leaders. Tucson Medical Center was proud to join other local businesses in providing funding and support for the 880-square foot renovation project. Other donors included Tucson Electric Power, Cenpatico, Vantage West Credit Union, BeachFleischman CPAs, architect Kim Wolfarth, Porter Construction Services, Aztec Flooring, Universal Wallboard, Gilbert Electric, Mesquite Valley Growers and Goodwill Industries. Additionally, nearly 100 individuals contributed resources – and sweat equity – to the project. In addition to financial support, TMC lent the skills of Construction Supervisor Shawn Cole as project manager. Cole has known of the organization’s work for a long time and appreciates the help it provides. Nicola Hartmann, the CEO of Youth on Their Own, said the space is getting a lot of use. Recently, staff held a summer “cool off party” for youth, with games, pizza and ice cream, as well as assistance with school work and college preparation. Kasey Hill, executive director of Greater Tucson Leadership, said the project epitomizes the goals of the program. A big thank you is in order to the four candidates running for a seat in the Ward 3 City Council race, who appeared at a candidate forum Tuesday night at Tucson Medical Center, sponsored by the Arizona Daily Star and the Tucson Hispanic Chamber of Commerce. The winner among the three candidates vying for the Ward 3 Democratic primary – Thomas Tronsdal, Paul Durham and Felicia Chew – will face Gary Watson, an independent, in the general election. The winner will assume the seat currently held by City Councilwoman Karin Uhlich, who is retiring from the Council. In addition to Ward 3, the Green Party has a contested primary race in Ward 6. Ballots will be mailed Aug. 9 to registered voters. Tucson Medical Center – as well as other hospitals and health institutions across the country – will be under threat if 23 million people lose their insurance in the coming decade under the American Health Care Act. That was the consensus of panelists at the Mayor’s Health Forum Tuesday, part of a series of forums taking place this week in cities across the state, from Phoenix to Flagstaff and Sedona. The forum, held at the Pima County Housing Center, was organized by Planned Parenthood. Julia Strange, the vice president of community benefit for TMC, said as the largest hospital in the city, TMC injects $740 million in economic impact into the region, supports nearly 6,000 jobs, cares for about 100,000 people a year in its emergency room, and reinvests millions back into the community in terms of education, outreach, charity care and other benefits. “I tell you all of this because TMC will not be the same if the AHCA happens,” she cautioned. After the Affordable Care Act brought coverage to 400,000 Arizonans, TMC’s charity care and bad debt plummeted from $25.8 million to $8 million. Unraveling that would undermine the viability of hospitals, which would ultimately impact everyone – from the vulnerable to the wealthy. “Even if you have insurance from your employer or are extraordinarily wealthy, coming to the hospital is the great leveler,” Strange said. “In our country, we don’t have a healthcare system for the rich and a healthcare system for the poor: It is for the community as a whole, and we need to invest in it to make sure the services we need are available when we need them,” Strange said, adding it is a moral imperative to protect the most vulnerable. Panelists urged attendees to share with their Senators, who are largely back in their districts, the need to reset the discussion to protect their constituents.